The Zane Williams team is preparing an impressive exhibit they will display for the world’s largest trade show, GlobalShop to be held in Las Vegas, Nevada March 18-24. GlobalShop features the most comprehensive array of retail connections and vendors in the world and will have six sections dedicated to the retail design industry. Located in booth #1187, the St. Louis printing company plans to display its extensive large format printing capabilities at the show in the form of product samples and the display itself which has been printed and assembled completely from Zane’s in-house capabilities. Zane will be featuring its in-house REXframe™ soft signage printing and custom framing system, as well as its printing equipment including the new EVO fabric printer. The company has invested over 4 million dollars in its state-of-the-art printing equipment and offerings. This is Zane’s first year exhibiting at GlobalShop. The company’s categories at the show include Tablecloths/Fabrics, Signage & Graphics, POS, Banners/Bannerstands and Floor Graphics. From working with retail giants such as Purina and Adidas to teams including the St. Louis Cardinals and St. Louis Blues, Zane Williams is well equip to handle virtually any scale printing project. Those attending GlobalShop can make an appointment to meet with a Zane Williams representative at the trade show by visiting http://n2a.goexposoftware.com/events/gs2014/goExpo/exhibitor/viewExhibitorProfile.php?__id=444 or by contacting Zane Williams directly on its website at http://www.zanewilliams.com or calling (800) 395-2468. Zane Williams is a 55 year old, family owned digital printing and retail signage supplier located in St. Louis, MO. The printing company has won many national and international awards for printing excellence, specializing in all types of banners, decals, soft signage, window decals, posters and POP. 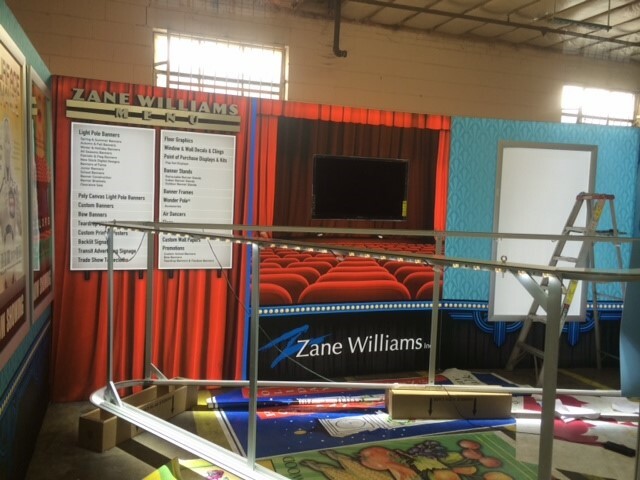 Zane Williams has partnered with REXframe™ to bring the very latest in soft signage displays and back lit graphics. Other services include, die-cutting, warehousing, fulfillment, shipping and tracking.